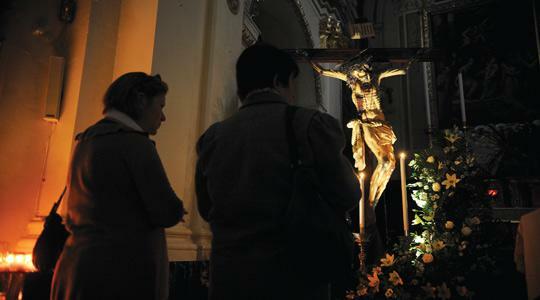 The miraculous crucifix at the Franciscan church of St Mary of Jesus (Ta' Ġieżu), Valletta, has been taken out of its niche for the first time in eight years and placed near the main altar, attracting thousands of pilgrims. Photo: Matthew Mirabelli. The miraculous crucifix venerated at the Franciscan church of St Mary of Jesus (Ta' Ġieżu), Valletta, was brought out of its niche yesterday for the first time in eight years and placed near the main altar. Franciscan friar Fr Leo Ciantar explained that the crucifix was exposed in anticipation of Pope Benedict XVI's visit on April 17. This was also done in view of the fact that the Pope has declared 2010 as the Year of the Clergy. Being Lent, Fr Ciantar said, the Church was extending an invitation to the public to confess on the occasion. Asked how many people visited yesterday, he said "thousands". People even came over from Gozo by organised transport: "We couldn't even keep up with confessions." "When the crucifix moves, the country does too," he said. Drawing countless pilgrims, legend has it that the sculptor found the statue's head complete after awakening after a night's sleep. A debate among scholars about its author was concluded only two years ago, when Fr Ġorġ Aquilina, a historian, stumbled upon a document identifying him as Frate Innocenzo Da Petralia.